Thanks to John Willson. Another of his memorable images from Hadleigh’s past. Unfortunately, there is no date with it. The original is a ‘proof’ and somewhat the worse for wear. I thought it worthy of spending some time on it, so I am adding another (improved?) photoshopped version. When was this and where? It’s not a case of ‘Made in Hadleigh’, but ‘Grown in Hadleigh’. There were enterprising people who bought fresh produce from the Colony and then trundled them around the streets for sale. What happened to the Farmers’ Market? 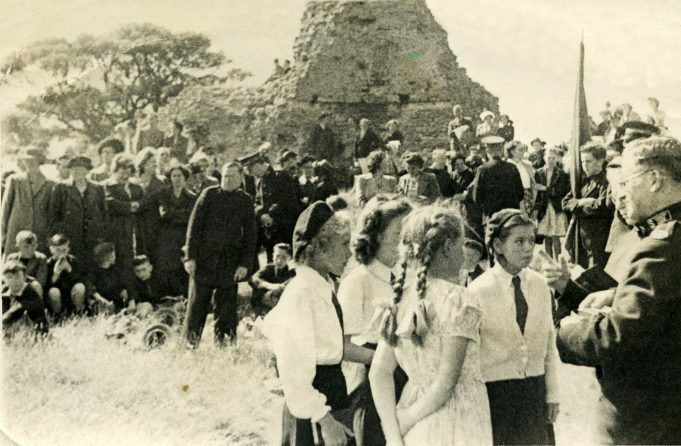 A Salvation Army gathering at Hadleigh Castle, 1951. Can somebody add more to this story? A glimpse into a Hadleigh childhood. Alan Hopgood at Castle House with his own transport system. 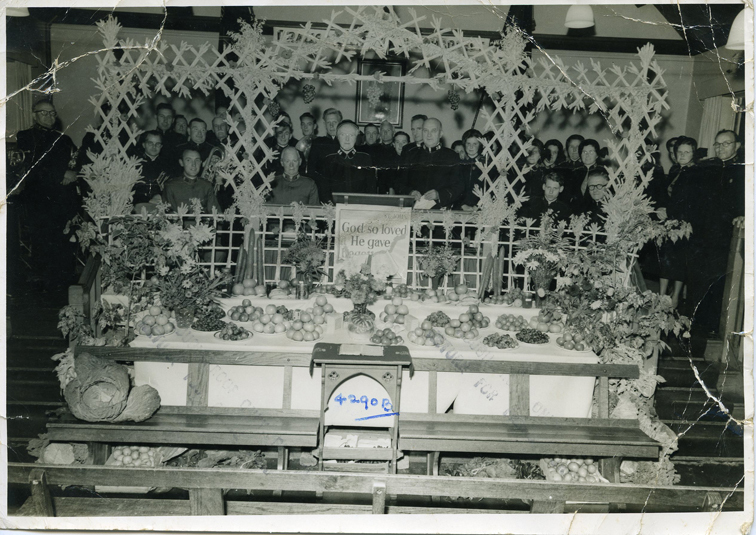 What was the occasion? Is the information regarding who owned the Castle correct? According to the information I have, the castle was given by The Salvation Army to the Department of Works in 1945. I know English Heritage was formed in 1983 so can only assume that SA must have had full access to the castle mount until 1983 but did not actually own the castle. Can anyone confirm please? John Willson writes: This picture was taken on Bank Holiday weekend, 1951, to celebrate the Festival of Britain. The occasion was held on the Castle grounds, which were then owned by the Salvation Army and not English Heritage. The Salvation Army Sunday School marched down to the Castle – there must have been a lot of children, including the Y P Band and Singing Company accompanied by the Scouts, Guides, Cub Scouts and the Primary Sunday School. Bill Ward is seen to the right of the picture and Fred Bright the YP Bandmaster in the middle. We were all presented with a Bible, suitably labelled inside the cover. (I must still have mine somewhere, for I never throw things away.) The Scouts pulled a cart with the Bibles on, down to the Castle from the Salvation Army Temple in the High Street. I remember the Scout Master, his name was Ron, and he worked at the Co-Op Bakery as the rounds-man. The area for his round was The Avenue, Church Road and adjacent roads. 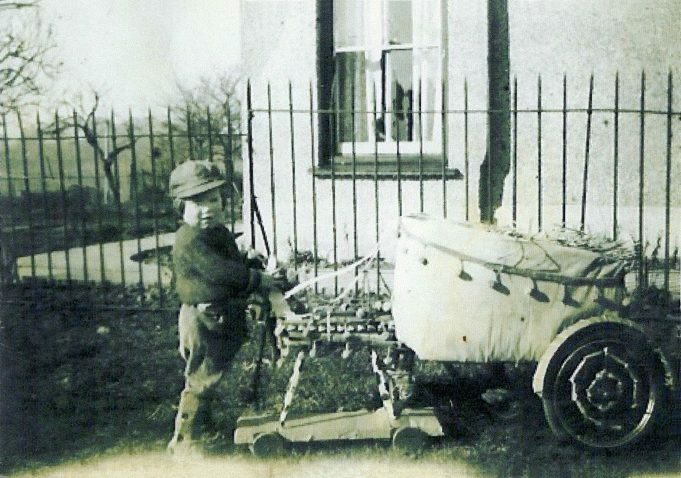 During the long summer holidays when I was bored, or had run out of people to annoy, I would help Ron with his round – for payment of course – and I’d help him push or pull this massive hand cart around the roads. It was bright red, very tall with two large boxes and with two big wheels. Ron used to give loaves of bread to me in a basket and I would deliver these to peoples doors. This job had its perks, fresh bread, hard crusts, bits “falling” off, yummie!!! Who could resist such temptations? 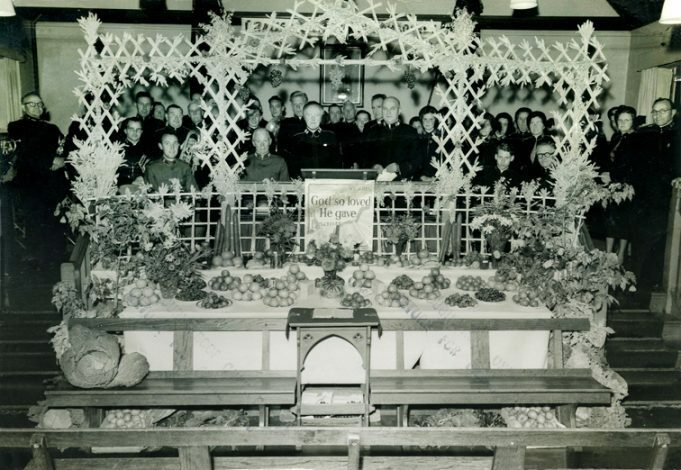 The other picture is of the Harvest Festival at the Temple in about 1953, Captain Tullock is seen sitting on the left of the front row. Colonel Bell, the manager of the Farm Colony, is in the middle and Commissioner Jakeway is standing up in the middle. Captain Tulloch’s wife died with cancer whilst they were at Hadleigh: they had two small children Bruce and Brenda. Mrs Tullock is buried in Hadleigh Graveyard to the right of the entrance pathway, near the front gate.